Does your aquarium look like someone poured milk in it? Cloudy aquarium water has several causes. Fixing the problem can be simple, but it it can also be a multi-stage process. How Did It Get So Foggy? There can be many causes for cloudy aquarium water. Below we will look as some of the root causes and how you can fix them. Be aware that often this problem goes along with other problems, such as Ammonia Spikes. Fixing this issue is important to keeping your fish healthy. If your water becomes cloudy just after you added gravel substrate and filled your tank, then you may have gravel dust in the water. This condition could cause your fish some problems. Turn off all your filter systems. Remove all the gravel and thoroughly rinse it using a spagetti strainer. Remember to use only cold water because some gravel has an epoxy sealer on it that may melt. Yours probably didn't if you have a gravel dust problem, but you never know. Put gravel back in your aquarium. Run filtration for 24 hours. If cloudy aquarium water occurs quickly after you first fill your fish tank or right after you do a large water change, then you could have dissolved minerals in your tap water. Water testing may also indicate high pH levels, but this is not always the case. Use extra water conditioner. About 1/2 again as much as you would normally use may clear this problem up in around 24 hours. If water conditioning does not work, use water that has been through a reverse osmosis filter. You can buy this water at a pet store or make your own if you have a reverse osmosis filter. Bacterial blooms can happen in new and established aquariums. If cloudy water occurs a few days or a couple weeks after you first fill your tank or do a large water change, then bacteria may have attached to dissolved biological matter in your water. This dissolved matter rots and creates ammonia that your helpful bacteria love. Bacterial growth explodes in your aquarium water and it becomes cloudy. 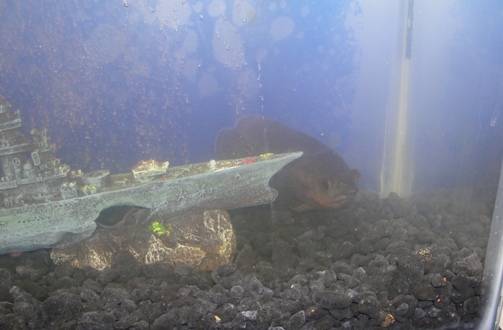 Do a 50% water change, making sure that you vacuum out your gravel at the same time. Add diatom filter media or a water polishing mechanical media to your filter system. Taking the tiny bits of biological matter out of your water can be a fairly slow process. It may take several days for this problem to be resolved. If cloudy aquarium water continues to be a problem, you may have gotten into a situation where you have to treat your aquarium for an Ammonia Spike. For more information on Cloudy Aquarium Water, go to Wikipedia's Fishkeeping page.